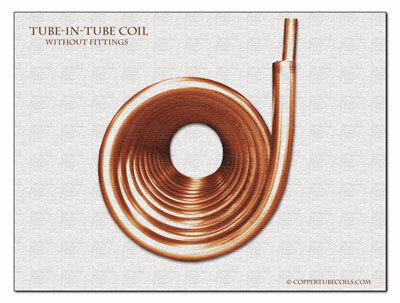 You have found the "Go-To" source for copper tubing coils, tubing, and custom coiling work for all your heat transfer and fluid management applications. With over twenty years of experience in the field, your heat transfer fixtures, oil separation tanks, condenser, heating, copper piping, or custom coiling projects are some of our specialties. We sell copper tubing in many sizes and shapes and in a variety of tanks and metallic containers, per your print specifications. Whether your coil is helical, serpentine, coaxial, or completely customized, all designs are accepted for review. 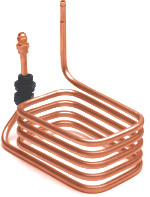 Both hard drawn and annealed, flexible copper tubing acceptable for forming and coiling. Easily outsource production runs of custom copper tubing coils or buy bulk loads of custom and non-custom length copper tubing, including level wound coils, water tubing and piping, refrigeration tubing, DWV and capillary tubing. 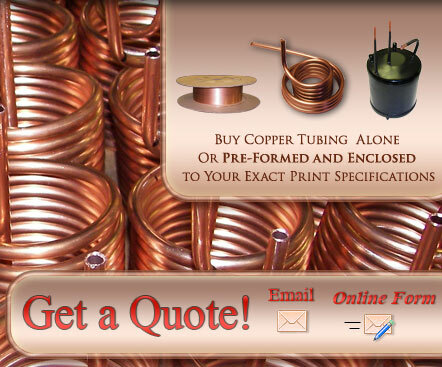 For every variety of coiled copper tubing, request a quote and get an answer quickly! Expect your coils and fittings to meet your exact order specifications down to +/- .020" in most cases. CTCG facilities are owner operated and ERP managed. Our primary service is to build tubing coils of virtually any material for all your heat transfer and fluid management needs. Impeccably simple designs all the way up to university-research complexity is warmly welcome. 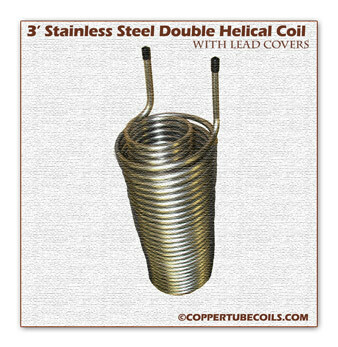 CTCG employs the use of fixtures and tooling that allow for quick production of copper tubing coils. Our extensive collection of machine tools and experienced engineers, along with proprietary technology and large workspace makes processing your larger orders as easy as the prototypes. Most projects can be easily manufactured, including such items as gas turbines, artistic projects, diagnostic hardware, in one to four weeks (and sometimes faster). Check our present inventory to see what tube types can be serviced this month. Companies across the country have found CTGC to be an excellent resource, from Job Shops to multimillion dollar corporations. Copper tubing is the ideal material for many applications. Its strength, the ease with which it is fabricated and soldered, and its high conductivity to heat is invaluable in the process of building homes and industrial buildings, particularly for the refrigeration and air conditioning equipment installed. Tubing made from copper is one of the few naturally-sourced materials that are 100% recyclable, so no metal is lost in reclaiming copper from pipes no longer needed, making it a good choice for the future. "Thanks a lot for all you have done (especially your patience) and a first class service." "Thanks for your fine work." Each Request for Quote requires the submission of at least one print, with dimensions, tolerances, and material type(s) required. We cordially ask for a single point of contact, along with their phone number and email and/or fax number to facilitate easier quoting. Be Very Thorough. The more information that you collect about your coils, the faster and cheaper (usually!) your quote will be. Legible prints with standard notation significantly ease quoting time. Plan Conservatively. Our job turnaround can run from 1 to 4 weeks depending on the sophistication of your project. A firm delivery range will be supplied upon receipt of your quote. Ask Questions. If your quote is lower or higher than you expected, make sure you inquire as to the reason. Sometimes, a simple change will result in over 50% savings. It's a Complete Service. Along with Coiling, Dozens of Secondary Services Are Provided. We sincerely thank you for giving us an opportunity to serve you! For a faster and more thorough quote, complete the long form. Because CTGC represents multiple companies with a variety of skills and machinery, your tubing products can be built quickly with a spectrum of expertise not limited by walls. With services from copper tube soldering, cutting, and forming to the custom production of heat exchangers and tubing coils for dozens of industries, your complicated project can be outsourced without a hitch. If you have special housings, fixtures, or fittings attached to your design, these items can be machined alongside the fabrication of the coil to make ordering easy and lightweight.